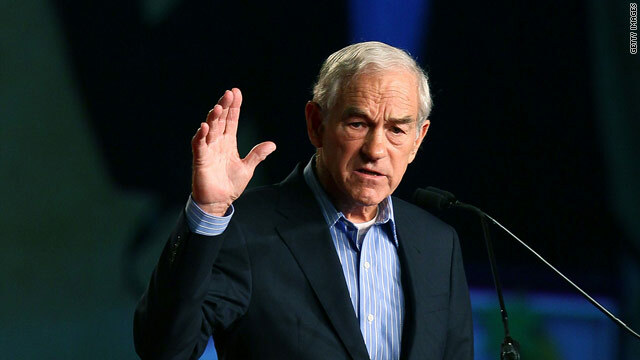 (CNN) - Republican presidential candidate Ron Paul rallied a sold- out crowd of more than 1800 of his most ardent under-thirty-year-old supporters in New York City Monday night. Tickets to the event cost $20-25. It was originally scheduled to take place at the famed Webster Hall's Marlin Room, but, the event had to be moved to a room twice as large at the last minute due to an overwhelming response. The final setting was in the Grand Ballroom, which has hosted celebrities to the scale of Mick Jagger and Madonna. "We are seeing a level of enthusiasm for Ron Paul that can be compared with President Obama in 2008", said Eric Brakey, Media Coordinator for NYC Liberty HQ, the grassroots organization hosting the rally for the candidate. "Congressman Paul's youth support is different now than it was during his last presidential campaign. It's more organized and it's picking up steam and continues to grow". As the longtime congressman from Texas stepped onto the stage, the crowd screamed with enthusiasm. The audience's biggest reaction came when he spoke about ending the Federal Reserve. "The country has changed in the last four years, but my message hasn't changed" Paul said. "The country is ripe for a true revolution". Responding to an earlier interview with Jon Stewart, he told the crowd that he is largely ignored by the media for a couple of reasons, one being that "people in charge don't want to hear our message". Paul, who's making his third bid for the White House, devoted the final moments of his speech to President Obama. "Obama thinks he is going to spend a billion dollars on his [re-election] campaign", but "when truth prevails you don't need a billion dollars". And to that, the audience burst out chanting the candidate's name and didn't stop until long after he excited the room. He is an interesting candidate certainly, in that I can honestly find no cases of him flip flopping or pandering on issues. I don't necessarily agree with all of his positions, but I can't discredit the man for having a vision and staying true to it. He is also the only Republican candidate I would even consider voting for at this point, though it is unlikely he will pass the primaries given the rather crazy conservative base. "But in the end, Ron Paul will just be another retired Congressman drawing a pension." No, he has refused to take a congressional pension. But don't let the facts get in the way of your hate. Stick a sock in it Paul!!! Larry L, you sound like a hater. Ron Paul is not a republican. He's a libertarian running on the republican ticket, because there are only 2 tickets to run on in this country. Also, revolution is exactly what we need. A revolution is real "change"; Obama was just more of the same thing we've had since at least 1913. Well, considering he ACTUALLY does remember the Boston Tea Party he would know. ---------------Godzilla the situation is becoming today what it was back then. Too many taxes for stuff we don't need and to support people we don't need to support. @Seattle Sue – Do a little research. Ron Paul declined his enrollment in the Congressional Pension Plan. We are in big trouble people, reading these posts really has me worried that we will head off the cliff. The hubris of the American people is insane to think we can't fail. Our empire is collapsing and will follow Europe shortly after, if we don't take drastic steps soon. Statements like American Exceptionalism and Change you can believe in are swallowed hook line and sinker by the masses. All of your social concerns will be irrelevant if we don't address our debt and the Federal Reserve System. The problems aren't wall street and our government representatives it's the Federal Reserve supplying the drugs "paper money" to them. Cut off the head "the federal reserve" and we can have growth again. My 2 cents and it's why I will only vote for Ron Paul. Understand this all fiat currency fails, evidence human history. Research it if you don't believe me. so am i supposed to fight my neighbor? a revolution should be nothing more then standing in front of the capital building and saying your fired to congress and the senate. ronnie boy ease up and fire yourself by enacting term limits and tell your cronies to respond to the voters when we ask questions. We need a revolution. Incremental change cannot fix the problems that have been created in the last 100 years. We need the country that we used to have, before the rise of globalism and corporatism and the disenfranchisement of the little streets. The republicans and democrats have worked together to disenfranchise us, by offering no real alternatives, by furthering the same corporatist and welfare statist ends. Ron Paul is different. He has been preaching (and voting) against the status quo for 30 years. It's time to give him a chance to lead. Lots of brainwashed Limbaugh/Hannity lovers here. The establishment appears to be threatened. But, the establishment needn't be scared. They have the CIA to remove any threats to their way of life. This country needs RADICAL change... this country NEEDS Ron Paul. Firstly, to Seattle Sue, Ron Paul has said he will NOT take his congressional pension. You didn't know that, ey? Might that be because you haven't listened to his message. Not your fault as you (and apparently many others posting here) obviously rely on the mainstream media for information. Please spend 5 minutes researching his message. Ron Paul is a GOD SEND! "Ripe for Revolution." He must be getting desparate. He's starting to sound like a Tea Partier. All these disingenuous attacks on Ron Paul do a real disservice to our country. I urge everyone who wants to know the truth to do their own research instead of being manipulated by the slanderous comments being posted here. I'm a father of three kids who came to the US when I was four and now run a small family business in New York. Ron Paul has helped open my eyes to the slow but sure collapse of our great country because of the corruption in BOTH parties. I want this country to be a place where my kids can be proud of and where they can live an amazing life. I just don't see it if we proceed down our current path. I was a registered Independent before switching to the Republican party to vote for Dr. Paul once I truly understood the consistency of his ideas. Btw, I was at Webster Hall also. Spoke to a few people there and did not bump into any crazies as the posts here suggest. Just people who are really concerned with the future of our country and want to do something about it. Got to love the tea party rants. First off, the tea party has not had power, still does not have power really and gets blamed for everything. Most people who whine and complain about the tea party have never even attended one single tea party event to see what it is about. Instead, they are told by their leaders "this is what you should believe about the tea party" so that is what they believe. Really amazing how well propaganda still works on some in this day and age. As for me, being Irish in America and looking objectively at American politics, really is astounding how people do not question their OWN leaders and believe only the other side does anything wrong, or immoral, or racist, or anything else. That is not the case. I would strongly recommend that both sides examine their own leadership before complaining about the other side. Ron's right-but it's going to be a revolution of the working and middle class against the privileged in this country who remain that way because the system is rigged in their favor. Republicans hate government giveaways unless they go to the top 2% of Americans and corporations.-at the expense of everyone else. Why would it be such a bad idea to divide the country and allow for choice? We can then all have a chance to get what we want-right? I can start from scratch if I have to – beats fighting. Our nation is in serious trouble, and if we continue down this path we are finished! You're right. We are on a dangerous path and need to turn in a new direction. This direction is the one laid out for us by GWB, and enforced to stay in place by Republicans for the past two years. Unfortunately, we must travel this road a little further to reach the corner so that we can make a turn. If we turn now, we go straight back into the ditch again. A lot of commenters here haven't researched anything on Ron Paul considering the shameless and baseless comments being posted. For example, he is a 12-term congressman and can't bring about change? Go look at his voting record maybe? He has been consistent with his ideals across all 12 terms. What is funny is that all of his talking points during all of those years are becoming mainstream now, and the MSM still does not give him credibility. And for all of those who say we need to tax the rich, let me put this out there. What happens when the government taxes the rich, and then gives that money to companies that fail like Solyndra or AIG? It's transfer of wealth from the rich to the connected rich. Great job guys! Those teapartiers are a violent group – crosshairs, lock and reload, revolutions.....sounds awfully militant! Watch out, America!! Really, now? Gee, sure would have been nice if you would have posted where they have been "violent" because I have never read or heard of any violence coming from the Tea Party. Try getting your head out of the sand and switch the TV station to some other channel other than MSNBC. The other reason being that he's about as crazy as a rat in a tin poop house. I know that his fans are rabid, but it is still a small minority. My feeling is that he is just plain unelectable. Most of the comments posted here are completely ridiculous. Trying to paint Dr.Paul as being too old, having too few supporters, or trying to label the Tea Party as racists and violent is just propaganda by both parties and their loyalists. Stop listening to these chuckleheads, and actually look at his voting record and listen to his speeches. Facts don't lie. If history serves as a baseline, the people most of you call crazy...will someday be labeled as survivors. Most of you will not be here to call them crazy anymore. Read your history, what is going on now has happened before. It does not matter who the blame goes to, if we all fall together. The whole world is on a runaway debt roller-coaster, screaming down the final drop, with no tracks headed up the other side. The people left after the crash have to build those tracks! JOBS! finally! Good ole' America will be back at the top first, again. The honest folk that help rebuild her will reap the rewards, again. Seattle Sue you are wrong Ron Paul will not just be another retired congressman getting a pension. He has opted out of the congressional pension program and the congressional health benefits. he feels congress shouldn't take from america but give. he has never taken a gov. junket. he has never voted to raise congressional pay. he has given the unused portion of his congressional budget back to the american people. about $90,000.00 this year. Has never voted for any bill that was unconstitutional. has never voted to increase the size of gov. and has never voted to raise taxes. Most importantly has never voted to take away our civil liberties and FREEDOM. All you haters should be ashamed for critisizing the man wthout even knowing who he is or what he stands for. Educate yourselves before it is to late to save america. All i am is me and all i want is to be FREE!!! !